It was Mother Theresa who said, “if you can’t feed 100 people, then just feed one” and that is how the Seeds of Faith Food Pantry began. 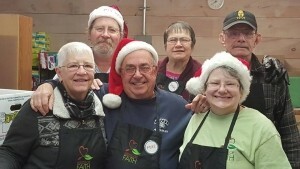 In 2007, the Seeds of Faith Food Pantry started in the Tozier Family’s tiny basement with a desire to help those who struggled with homelessness and food insecurity. The operation quickly outgrew the basement and in 2011 (with the gracious donation by Cutter Family Properties), the Seeds of Faith Food Pantry relocated to its present location in the Mills at Salmon Falls in Rollinsford, New Hampshire enabling us to not only serve more people in need, but also allowing for more food storage and selection. It is encouraging when DONORS make it possible for us to say ‘yes’ to one more child, family, or deserving adult who comes to us for help. It is the generous donations of individuals, businesses and churches that keep the food pantry running each month. The Seeds of Faith Food Pantry is able to help hundreds of families with food items, household supplies, diapers, and winter wear. But as hard as we work to stretch every dollar, the need outweighs the resources. If you would like to donate to the Seeds of Faith Food Pantry, please send your monetary donations to the address below or visit our Donate link. On behalf of our team of staff and volunteers, THANK YOU for helping make compassion a reality within our community. Your donation does make a difference one life at a time and we appreciate you!